These bright-colored beauties are blooming right now outside of the New England Institute of Art, right at the corner where buses 65 and 66 pick up. I passed by them this morning and they were so pretty I had to take a picture. I’m a fan of minimalism in gardens. Some people like the wild look, flowers everywhere, every inch of dirt covered. In my opinion, if you’re going to the effort of actually gardening, make it look cleaner and and more intentional. I’m not into really cluttered flower arrangements either. Two or three colors are best (aside from the green of the stems and leaves), and I prefer a smaller bunch of notably pretty flowers, rather than a huge bunch of just ok ones. (I won’t say no to a bouquet of roses, though.) I like Ikebana for its minimalism as well. Take these tulips as an example. If they were being crowded by thousands (more likely tens, but you get the picture) of other flowers, would they be as visible? Would they be as beautiful? Would they, in fact, even be the same color? They might be duller, and it would be fact, as perception is some high percentage of reality. 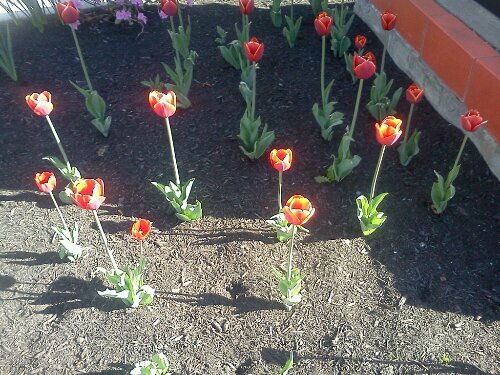 This entry was posted in writing and tagged complement, flowers, gardens, minimalism, perception, spring, tulips, writing. Bookmark the permalink.